If you are over 40, you are likely looking for things to do at World Pride that don’t involve going clubbing until the early hours! We all try to do it sometimes but thankfully at World Pride there are more options to show your Pride at a more leisurely pace. For those of us that love a good movie, NYC Pride’s OutCinema, in partnership with NewFest and the SVA Theatre, celebrates the LGBTQIA+ community on film from Mon, June 17 – Weds, June 19, 2019. The festival features three days of films that speak to the LGBTQIA+ experience. These specially curated screenings are followed by special Q&As and open bar after-parties. Films have yet to be announced but you can buy your tickets here. There is also Family Movie Night with family-filled fun! Films are appropriate for all ages and the night is hosted by the drag legend Miss Richfield 1981. This Midwestern maven wins over theater audiences with an interactive format that combines homespun warmth and edgy improv, leaving audiences in hysterics. Family Movie Night is free for all guests to enjoy. If you’re looking for a premium viewing experience, check out the family package here. Movie details to be announced. Join the LGBT Community Center on Monday, June 24 from 6 to 10 pm for a Garden Party, the official kick-off of World Pride. 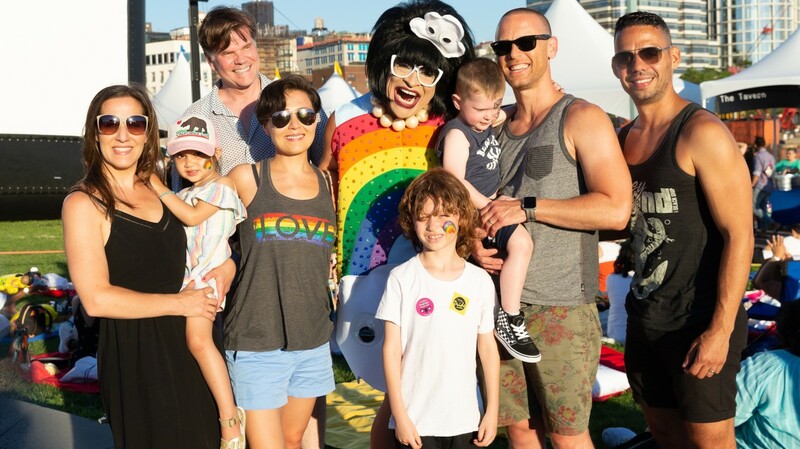 Enjoy delicious, seasonal bites from a diverse selection of restaurants and celebrate Pride as the sun sets, and then dance into the night! Proceeds from Garden Party support The Center’s life-changing and life-saving programs and services and keep the doors open 365 days a year. Click here to get your tickets. After a wildly successful first year, NYC Pride & God’s Love We Deliver are bringing back this one-of-a-kind immersive culinary fundraiser. Bringing together LGBTQIA+ and ally chefs to craft a special menu with epicurean delights. Set outdoors on the terraces of God’s Love We Deliver’s headquarters, the chefs will cook up varied menu items while providing in-depth cooking demonstrations, discussions, and delightful tastings. Come mix, mingle and nosh with friends and kick off the weekend in style. Proceeds will benefit NYC Pride and God’s Love We Deliver. Click here to book tickets.